Introducing our new Terafloat! Battery operated, attached lighting, and slim, lightweight design! Allowing individual attention to each tooth. Small enough to fit into a mini’s mouth, yet powerful enough for a draft. 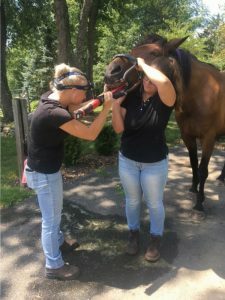 Non-abrasive engineering allows for the least amount of stress to your equine. We have the ability to come to you to provide top quality care for your mare, gelding, stallion or foal 24-hours a day. With regular check-ups and vaccinations, you will not have to worry about the basics when you are a patient of ours. ** Check out our available Wellness Packages and apply today!